A permanent and final divorce is called a “divorce a vinculo matrimonii” (meaning from the bonds of matrimony) in Virginia. All divorces require proof of grounds. 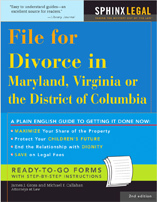 If you are filing for divorce, you have to have grounds before you file. If you cannot prove your grounds for divorce, accusing your spouse of these grounds may be grounds for the award of legal fees to your spouse. Pending the final divorce you should not do anything to give your spouse any grounds for divorce because it can probably be used against you. In Virginia you can be living separate and apart under the same roof, but this is difficult to prove, and requires planning. 2. Felony conviction – at least one year imprisonment. 3. Cruelty – one year after the act of cruelty. 4. Desertion continuing for one year. 5. Voluntary separation – for one year without interruption or marital relations and no reasonable prospect of reconciliation. If there are no minor children and the spouses have a written separation agreement, the require period is six months. In Virginia you can be living separate and apart under the same roof during the required separation period, but this requires careful planning and can be difficult to prove.